Choose vinyl flooring for a beautiful and easy-to-maintain upgrade in any part of your home. With its sturdiness, affordability, and a wide selection of styles and colors, vinyl floors are a tremendously versatile flooring choice. Whether you are installing a new floor or replacing your existing flooring, our professionals are at your service each step of the way, from expert design to installation of your new floor. 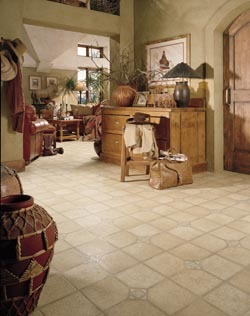 Our vinyl tile flooring is cost effective and stylish. With many choices of colors, designs, and patterns, our vinyl sheet or vinyl plank flooring is sure to fit any décor or budget. In every facet of our work, we offer the experience and craftsmanship to make your flooring project a success. If you enjoy the timeless, elegant look of stone but it's not in your budget, then our selection of vinyl tile flooring makes an outstanding alternative. Along wih popular luxury vinyl tile, also known as "LVT", vinyl tile is one of the most cost-effective flooring choices on the market. With today’s advanced manufacturing techniques, it accurately mimics the look and feel of natural stone, offers a warm, cushioned feeling underfoot, and withstands high traffic. LVTs affordability also makes it an ideal way to add the sophistication of materials like travertine, limestone, or marble to any room, without the associated expense or maintenance. For an added layer of realism, LVT can be laid with grout, just like ceramic, porcelain, or stone. Our flooring specialists often recommend vinyl sheet flooring as a durable and family-friendly option. Sheet vinyl's superior scratch resistance allows for a lifetime of heavy use. Because it arrives in a single roll, sheet vinyl can be installed in just a couple of continuous strips, making your new vinyl floor virtually impenetrable by spills and moisture. In combination with its hardiness, sheet vinyl can be printed and stamped in any number of patterns, colors, or textures, making it a key choice for any style of home decor. Add the distinctive look and feel of hardwood to any floor with the addition of our vinyl plank flooring. Also known as luxury vinyl plank (LVP), this flooring option is an elegant, yet affordable, means of upgrading your home. LVP realistically recreates the warmth and distinction of natural wood flooring in a variety of finishes and grain patterns. Paired with the added durability and lower cost of maintenance associated with vinyl, our plank flooring is perfect for any application, from living and sleeping quarters to bathrooms and utility areas. Once you've selected the new flooring material and design that best fits your needs, allow our vinyl flooring installation experts to ensure your project is completed in an affordable, stress-free manner. Our staff works diligently to leave you with an attractive new floor that accurately reflects the decorating plans for every room in your home. In order to ensure your complete satisfaction, we carefully prepare our workspace and finish our job in a timely fashion. It is our goal to operate in a way that minimizes the impact of our presence on your family's lifestyle. Contact us today in Stroudsburg, Pennsylvania, and allow our friendly staff to help you choose and install your new, budget-friendly, vinyl flooring. Ask about our up to 60 months of flexible financing.